TYCO produced a number of items based on Australian prototypes that were marketed to the Australia model railroader. These HO-scale trains were made in the early/mid 1970s. 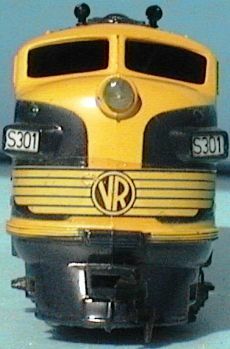 Sharing blue and yellow paint that is similar to TYCO's Santa Fe Freight Scheme F-9A is this Victorian Railways S-Class Diesel Locomotive carrying the roadnumber 301. The TYCO model takes some liberties from the Australian prototype, the original S-Class loco was a six-axle diesel that was longer than a typical EMD F-unit and shorter than an E-unit. TYCO did correctly number this model for an S-Class unit, as the prototypes were numbered S300-S317. Featuring a brown-and-yellow scheme, this F-9A from the TYCO line was modeled after the NSW's examples of their 42-Class engines. The prototype model is the same diesel as the VR's S-Class diesels, so again TYCO was using some creative license by substituting its F-9 for this Australian diesel. 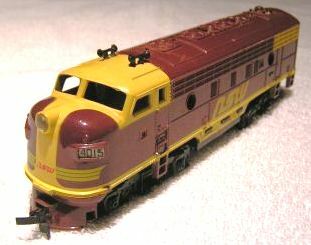 This model carries TYCO typical '4015' numberboard found on many U.S. F-9s, the NSW's 42-Class diesel began their numbering at 4201. A standard TYCO Extended-Vision Cupola Caboose in what appears to be typical Santa Fe dress is lettered in white for Victorian Railways. For those not familiar, in Australia a caboose is known as a "guard van." This model is of an American-style prototype and doesn't not look at all like what was actually found on the VR, though the logo is correct and was found on freight cars. The information found on this page regarding TYCO's Australian HO-scale items is available courtesy of Cameron Milne of Australia. Much appreciation to Mr. Milne for taking the time to provide the input used to help create this section of the site.